No matter how you look at it, baseball is all about numbers. From ERA to batting average to the digits worn on a ballplayer’s back, the game lives and breathes numbers. Some numbers have taken on a life of their own and just the mention of them evoke a special moment in the history of the game: 714, 755, 406, 42, 7. For decades, one of the most unassailable numbers in baseball has been 477. That number sits at the top of the all-time single-season batting average list, so close to perfection that no one came close until Gary Redus hit .462 in 1978. But as baseball historians were quick to point out, .462 wasn’t .477, and a long forgotten shortstop named Walter Elmer Malmquist remained the all-time professional baseball batting champ. In the 1970’s, David Kemp of the Society for American Baseball Research began chipping away at the Malmquist myth. In this pre-internet ear, Kemp had to cull through microfilm of Nebraska newspapers trying to reconstruct Malmquist’s 1913 season. Kemp was able to gather 97 of Malmquist’s 110 games and came up with the more terrestrial batting average of .342. Nothing to sneeze at, but not even close to his attributed .477. Despite Kemp’s research, Malmquist and his .477 remained as the all-time champ. 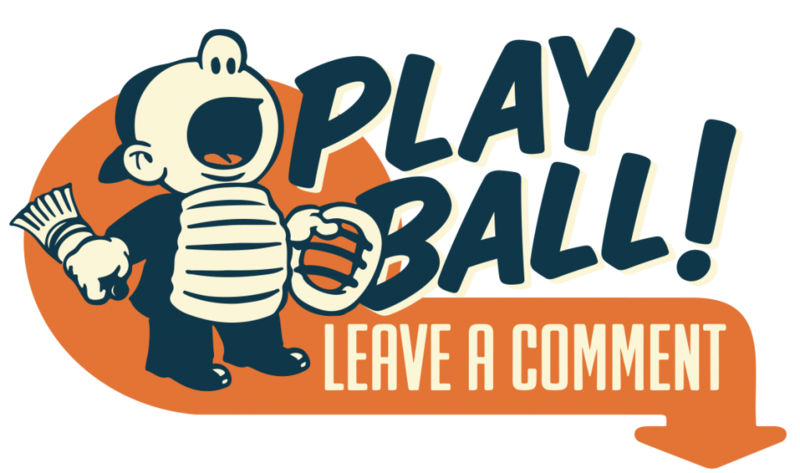 There’s a few reasons why this is so, the most prevalent being the insurmountability of trying to change a long-established baseball statistic. In a game so entrenched in numbers, this is like trying to parallel park an aircraft carrier. Plus, once you make changes to a long-held statistic, it makes people wonder if other beloved statistics are incorrect as well. It begins to rot the whole foundation of the game, giving birth to as many cynics and conspiracy theorists as the JFK assassination. Another reason Malmquist’s .477 has lasted despite all the warning signs of its inaccuracy is that many of us want to believe he did it. In this I mean you expect a Ted Williams or Ty Cobb to hit above .400, but Walt Malmquist? Baseball fans love an underdog, and there ain’t any more of an underdog than a guy named Walt Malmquist. To begin with, Malmquist never played a single game in the major leagues, heck, he never made it past what today would be called Double A. An unknown farm boy from Nebraska holding the single-season batting average record is what makes the game so much fun and enduring. He’s one of the best trivia questions a baseball geek has in his arsenal, and his lack of backstory creates the perfect baseball legend. All that aside, I wanted to go back and re-create Malmquist’s 1913 season from contemporary newspaper box scores. In this internet era, I figured that I would have greater access to 1913 newspapers than David Kemp did back in the 1970’s, and this was in fact correct. I instantly hit pay dirt as both of Omaha’s big dailies, the World-Herald and Daily Bee, were both available digitally. And what’s more, both regularly carried the box scores from the Nebraska State League games. So, with the information just a click away, I returned to 1913 and began re-compiling Walt Malmquist’s record-setting season. But first, who the heck was Walter Malmquist? Walter Elmer Malmquist born in 1890 to Gustaf and Salma Malmquist, immigrants from Sweden. The Malmquist’s farm was located in a place called Charleston which no longer exists, but according to baseball historian Bruce Esser, its location was southwest of York and east of Henderson. Walter was the fourth of Gustaf and Salma’s five children, and like most farm boys, he left school after the 8th grade. In turn of the century America, every town had a baseball team, and it can be safely assumed that Walter learned the game as a boy and continued to play in his spare time. In 1912, the 21 year-old signed on to play for the York Prohibitionists of the Nebraska State League. The Nebraska State League was classified as a Class D league, the lowest rung on the minor league ladder. Besides Malmquist’s York Prohibitionists, the State League had seven other equally amusingly named teams: Kearney Kapitalists, Hastings Third Citys, Fremont Pathfinders, Superior Brickmakers, Columbus Discoverers, Seward Statesmen (replaced mid-1913 by the Beatrice Milk Skimmers), and the Grand Island Collegians. Most of the players were local boys getting their first taste of professional ball, and just like today, most of these entry-level ballplayers didn’t progress very far. Still, the 1913 Nebraska State League did have a few diamonds in the rough, including future Hall of Famer pitcher Dazzy Vance, while Joe Lotz, “Glass Arm Eddie” Brown, Walt Meinert, Rolla Mapel, and Red Smyth would all have cups of coffee in the majors before World War I. The 1913 season began under a cloud of tragedy when the town of Seward was hit with a devastating tornado on the eve of Opening Day. Ten residents were killed and over twenty homes destroyed. The preoccupation of rebuilding placed the town’s entry in the Nebraska State League in a precarious position. However, the season kicked off as scheduled on Thursday, May 15. Fifteen hundred York fans filled Athletic Park as twenty-two year old Walter Malmquist took the field as the Prohibitionist’s shortstop. This was his second season with York, having hit a pedestrian .241 in 105 games in 1912. (It is reported that Malmquist played for York in 1911, though I have been unable to find any box scores that prove this). The man who would be crowned the Nebraska State League’s batting champ was singled out in the game report not for his bat but for his fielding miscue that led to a three-run first inning for visiting Kearney. This would be a running theme in Malmquist’s 1913 season. Since he played second base or outfield for the rest of his career, it appears that Malmquist was unfamiliar with the shortstop spot and struggled all season long. Unfortunately, no box score was published for York’s first two games, so we do not know how Malmquist fared. We do know that he hit a rally-starting double in the second game of the season, which York won 1-0. Fortunately, after those first games, the Daily Bee or the World Herald published a box score of almost every other game of the season. A careful culling of the archives left me with only 8 missing games out of the 112 York played that year. Malmquist started out the season in fine form, posting five multi-hit games in May and finishing the month with a nice .341 average. It appears that Malmquist was primarily a singles man, registering only one double in May. There was a bit of drama off the field as well when York’s manager Frank Gardiner was arrested on May 30th. The story was that Mrs. Gardiner was walking in downtown York when a creep named Harry Hall abused her both physically and verbally. Mrs. Gardiner was able to extricate herself from the perilous situation, but Hall wasn’t so lucky for as soon as the Prohibitionists returned from their road trip two days later, Mr. Gardiner located Hall and beat the hell out of him with a baseball bat. The pounding was so severe that for a time Hall was thought to be near death, and York’s skipper was tossed in the hoosegow to cool off. A week later the DA filed “assault with intent to do great bodily harm” charges and the ball player found himself in quite a bind, as he now had to fund a legal defense. The York and Hastings clubs came to his aid by playing an exhibition game on June 5, the proceeds all going towards Gardiner’s legal fees. Four prominent local citizens came together to post Gardiner’s $800 bond and he was released with a court date set for November. He returned to his player-manager role, no doubt earning some serious street cred with the rest of the league, but, as we’ll see later, the incident was far from over. June brought some restructuring to the league. Seward, still recovering from the terrible twister that wrecked havoc upon the town, could not support its ball club. Faced with financial ruin, the team relocated to Beatrice where they became the Milk Skimmers. Malmquist dipped at the plate, usually managing only one hit per game. His power slacked as well and he recorded only one extra base hit the entire month. Out of the 29 games played in June, I have found 25 box scores. In these, Malmquist went 27 for 96, an average of .281. This brought his season average to an even .300 going into July. York’s shortstop’s bat began heating up after July 4. In the traditional double header, Malmquist went a combined 5 for 9 with a double. He hit steadily throughout the month, finishing up by hitting home runs in two consecutive games on September 29 and 30. In 31 games he went 36 for 109 to get a .330 average. His season total was now .313. August saw Malmquist continue the hot hitting, though at a much more modest pace than that which would denote a .477 hitter. However, numbers were being jumbled somewhere behind the scenes that would add up to one of the biggest miscalculations in sports history. As early as August 24 it becomes obvious that something was screwy with the Nebraska State League stats. In that morning’s Omaha World-Herald, Malmquist is recorded as posting the 18th best average in the league: 289 at bats, 97 hits, .335 average. To start, that averages to .336, not .335, but that’s the least of our worries. According to the box scores through August 24, Malmquist was credited with 105 hits in 334 at bats, giving him a .314 average. Granted, there are 8 box scores missing, but even if Malmquist was taking a Barry Bonds cocktail and went 4 for 4 in all 8 missing games, his average swells to just .374 – better than the credited .336 but much lower than the pace needed to end up with .477 a season’s end. Malmquist finished up August with a strong .324 average, with 7 doubles sprinkled in. On the fielding side, he had his worst month, tallying 17 errors including a miserable 3-error day on the 22nd and an even worse 4-miscue afternoon on the 26th. As the season entered its last weeks, York sat firmly at number 3 in the standings, 10 games behind the Kearney Kapitalists. Malmquist’s bat cooled in the last stretch, managing only 11 hits in 36 at bats, a .306 average. September did hold three positives for Malmquist. The first was that he seemed to get his fielding under control, being charged with just a pair of errors in 9 games. The second high note of the month was that he hit his third homer of the year in his final at bat of the season. The last big of good news for Malmquist was that his contract was purchased by the Waco Navigators of the Texas League for $700. The Texas League was a Class B loop, two rungs higher than the Nebraska State League. York’s skipper Frank Gardiner finished out the season with his club, then violated his bond by taking a train east to Indianapolis. There, instead of keeping a low profile, Gardiner further gummed up his life by attacking a guy named John Donovan, beating him into the ground and “kicking one of his eyes out.” This recent snafu landed Gardiner in an Indy jail on a $2,500 bond and cause “four prominent citizens” of York to lose their money from the bond posted in June. From here Frank Gardiner disappears from history. A news photo taken at the New York Yankees spring training camp in Texas shows an umpire by that name, but it is unclear if this is the ex-ballplayer. On October 10, the final statistics of the Nebraska State League were released. At the top of the batting was Joe Lotz with .479. Since he played in just 47 games, the crown went to Walter Malmquist, credited with 154 hits in 323 at bats for the magic number of .477. When Reach published its 1914 Baseball Guide it duly credited Malmquist as the league leader with .477. With this national publication, Malmquist and the number 477 had become part of baseball history. Later in the century, those early Reach Guides were used as a starting point for baseball historians who tended to accept the stats published within their pages as fact. Malmquist became a staple of newspaper sports page Q&A column and as late as September 2003 Baseball Digest credited Malmquist with the highest single-season batting average. However, the advent of the Society for American Baseball Research in the 1970’s unleashed a legion of eager and diligent amateur sleuths who set about dismantling long-held baseball beliefs and buttressing others. As stated at the beginning of this story, David Kemp did the first large-scale mining of Malmquist’s record in the 1970’s, and now, four decades later, I believe the 103 box scores I found out of the 110 games Malmquist played in 1913 gets us even closer to his true record. In 394 at bats he had 126 hits, adding up to a .320 batting average – a full 157 points lower than his official average. I know what you’re thinking – what about those 8 games we don’t have box scores for? Well, even if Malmquist went agro and had 4 hits in 4 at bats in those 8 games, (32 for 32), his average inflates to .371, a far cry from .477. Interestingly, the Nebraska State League stats that have Malmquist hitting the bogus .477 also shows the shortstop making 45 errors in 110 games. This is the only stat that jives with what I tallied: 44 errors in 103 box scores plus 1 more from the Opening Day game from which I could only locate a game summary. So what the heck happened back in 1913? I have no clue. Maybe Walter was a drinking buddy of the league’s official scorer or someone with the math skills of an art student was in charge of the Nebraska State League statistics that year. Truth is, we’ll never know. If we assume the rest of the existing 1913 Nebraska State League statistics are correct, Kearney’s catcher/outfielder Dolly Gray was in fact the league’s batting champ. Dolly, whose real name was Homer Gray (at this time any ballplayer with the surname of “Gray” was nicknamed “Dolly” because of the popular music hall song “Goodbye Dolly Gray”), was a career bush leaguer from Illinois who, like Malmquist, was in his second year of pro ball and had also posted dramatically improved 1913 numbers that were a far cry from his .258 average the year before. The official stats show Gray hitting .411 in 111 games. However, with the complete mess made of Malmquist’s stats, who can tell for sure whether or not Gray’s are correct? As for Walt Malmquist, he progressed to the higher-level Waco Navigators of Texas League. If Waco was expecting a Nebraskan Ty Cobb to show up, they were sorely disappointed as Malmquist hit a combined .237 in his six seasons with the team, never batting higher than .250. Malmquist served in the army during World War I, going to France in August 1918 with the 338th Machine Gun Battalion of the 88th Division. He returned home in May 1919 and resumed his baseball career. Waco kept him around for the ’19 season and then he moved on to play for Hamilton and London in the Michigan-Ontario League. He wrapped up his minor league career by putting in three seasons with the Corsicana Oilers of the Class D Texas Association, retiring in 1925. Malmquist returned to York where he married local girl Lillian Otellia Swanson and operated his own farm until his death in 1970. In the decades since 1913, countless record books and newspaper columns touted his .477 as the highest single-season batting average in pro ball. What Malmquist thought about this distinction is unknown. It is this missing piece of the puzzle that I find so interesting: what did he do when people asked him about that record setting summer back in 1913? Did he try to correct the record, or did he just sit back and nod his head, letting the world go on, blissful in the thought that in 1913, a farm boy from Nebraska, who never played a day in the majors, set a baseball record that would never be broken. Like I mentioned last week, I have been working on a new project based on the stories and drawings I do here at The Infinite Baseball Card Set. 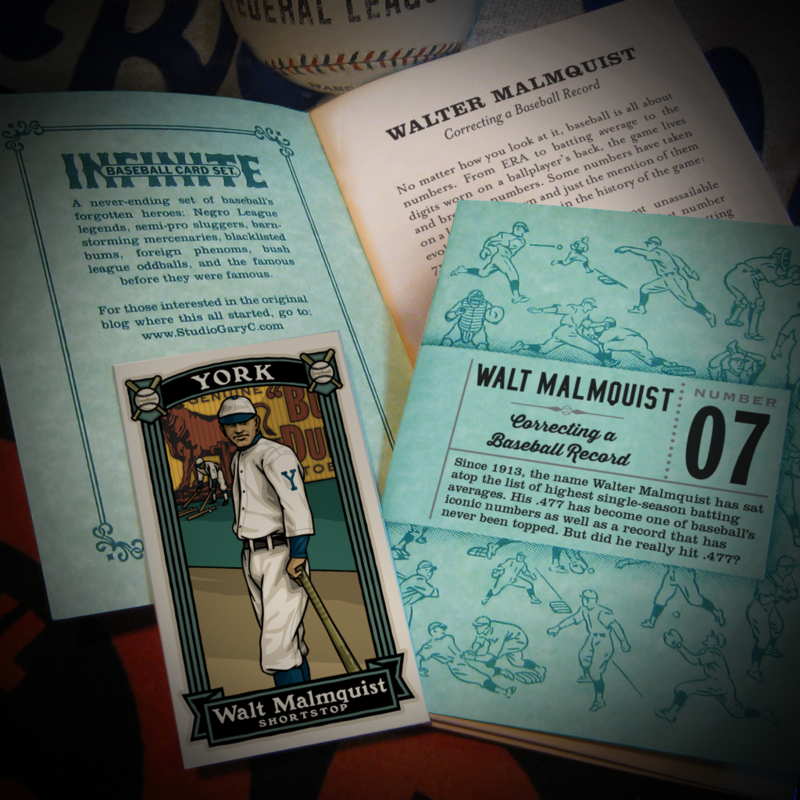 The new product is a series of collectible booklets, and this week’s story of Walt Malmquist is Number 007 of the series. Because these will be handmade in my studio, the production number of each booklet will be low, available on first-come – first serve basis. Many, but not all, of the stories in The Infinite Baseball Card Set will be made available as a booklet, but I will be doing others that will only be available in print form.